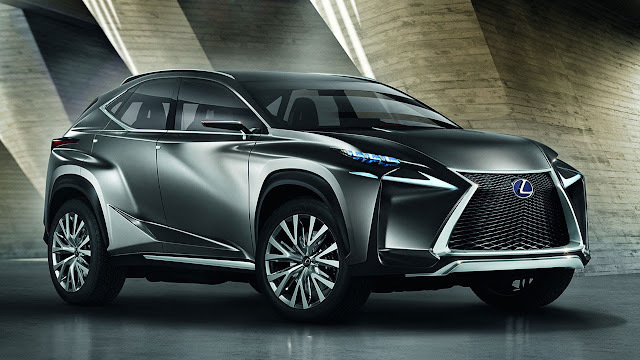 A new Lexus mid-size crossover concept, the LF-NX, made its world debut at the 2013 Frankfurt motor show, a study that explores the potential for this kind of vehicle in the Lexus model range. 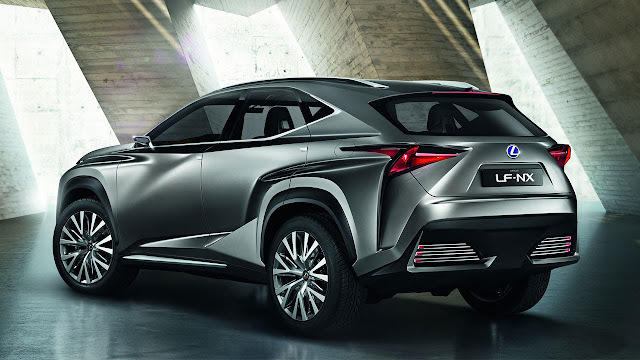 The LF-NX reinforces Lexus’s leadership in hybrid power in the premium market, being powered by a new variation of the Lexus Hybrid Drive full hybrid system, tuned for SUV performance. The powerfully sculpted styling reflects a further evolution of the L-finesse design language that influences the look of all today’s Lexus models. 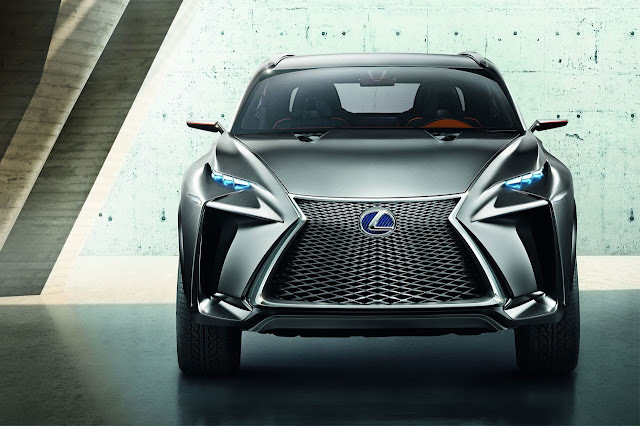 The car’s frontal appearance is dominated by a strong interpretation of Lexus’s spindle grille and a signature arrangement of the front lights. The daytime running lights are given added visual emphasis by being positioned independent from the headlamps, in a similar fashion to the new Lexus IS. The LF-NX also displays a distinctive treatment of the front corners, which separate the bumper from the front wings with a sharp vertical cut line. 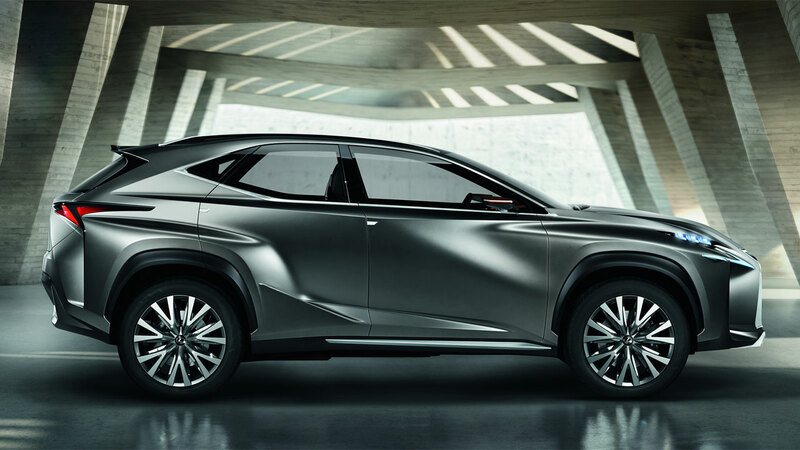 In profile, the LF-NX concept presents muscular wheel arches, edged with a black protective finish that expresses its urban crossover character. Above the pronounced diamond shape of the belt line, the side glazing is arranged in the classic Lexus profile, which works with the steep rake of the tailgate to create an athletic coupe-like silhouette. At the rear the highly articulated lamp clusters project down the full depth of the bumper, creating a sharp, aerodynamic trailing edge to the vehicle that mirrors the detailing of the front wing design. The concept is being presented in a new Brushed Metal Silver exterior finish that creates a striking impression of the car having been carved from a single piece of solid metal. The interior mirrors the highly sculpted approach to the exterior with powerful forms and a highly ergonomic driver’s cockpit. 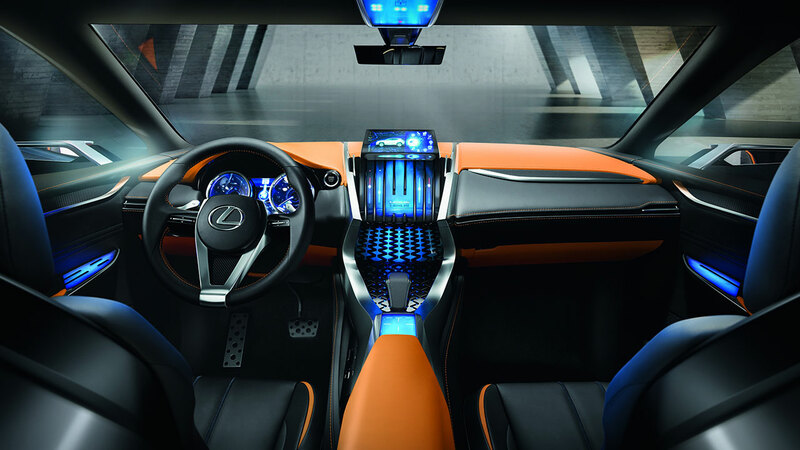 The cabin follows the “Human Oriented” element of Lexus’s L-finesse design, presenting a dashboard divided between an upper display zone and lower operation zone – a format perfected in successive generations of Lexus models. This enables intuitive interaction with the concept vehicle’s next generation technology, including touch-sensitive electrostatic switches and a new touchpad Remote Touch Interface design. The concept’s status as a premium crossover is reinforced by carved metal surfacing around the interior, sophisticated blue instrument lighting and yellow and black leather upholstery with contrast stitching.